The Nationals begin this four-game home-and-home series with an 8.5-game lead over Miami in the NL East Division title race after taking three of four games against Atlanta this past weekend. They are now 4-3 MLB picks in the first seven games of a nine-game road trip. The total went OVER BetAnySports closing 8.5-run line in Sunday’s 7-6 loss to the Braves as heavy -175 road favorites and it has now gone OVER in nine of their last 11 games. Washington has done a good job at getting runners across the plate on this road trip with an average of seven runs a game over its last seven contests. It will look from a strong effort from Stephen Strasburg on Monday night as its starter. The right-hander is 15-4 on the year with a 3.59 ERA and a 1.11 WHIP. He is coming off a rough outing last Wednesday that only lasted 1.2 innings after he was shelled for nine runs on nine hits in a loss to Colorado. Baltimore has slipped to 2.5 games off the pace in the AL East with just one win in its last six games. It dropped three of four at home against Houston this past weekend after losing two straight to Boston at home last week. 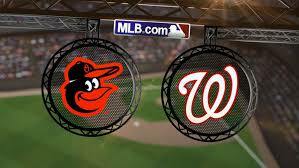 The Orioles are now 67-56 on the year with a 40-22 record at their home ball park. The total stayed UNDER 9.5 with BetAnySports in Sunday’s 5-3 loss to the Astros as slight +106 underdogs at home. It had gone OVER in six of their previous seven games. Pitching has been an issue for the Orioles during this recent slide with an average of 8.3 runs allowed over their last six games. They will turn to Dylan Bundy as their starter to try and get the early edge in this series. He made his seventh start of the year last Wednesday against the Red Sox and he only lasted 4.1 innings after giving up five earned runs on nine hits. It was just his second loss in his previous six starts. The way that the Nationals have been scoring runs coupled with the way that Baltimore has been giving them up makes a play on the?